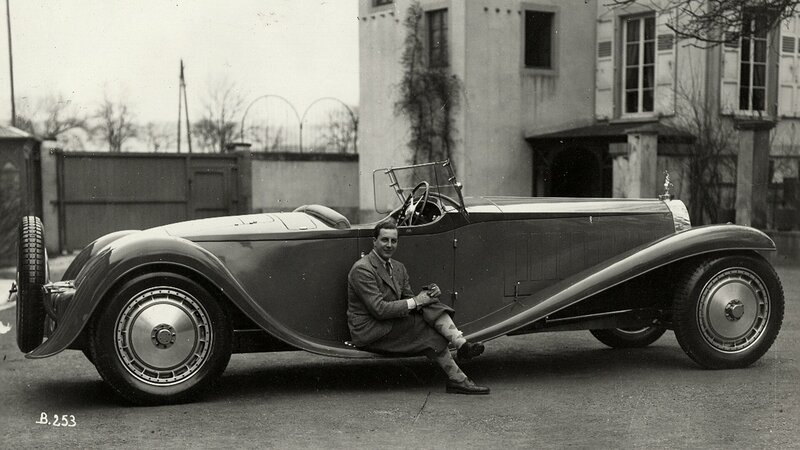 Jean Bugatti was born today 110 years ago, the same year his father founded the company. Jean Bugatti, the eldest son of Bugatti founder Ettore, is one of the most distinguished figures in the company’s long and proud history. Having become the creator of the most iconic Bugatti vehicle and leading his father’s company at the age of only 27, he tragically suffered a fatal accident in 1939. Today, he would have turned 110 years old, coinciding with the celebrations of the 110th anniversary of Bugatti. On January 15, 1909 Jean was born in Cologne where his father Ettore worked as head of the production department of Gasmotoren-Fabrik Deutz AG. Jean’s full name, Gianoberto Carlo Rembrandt Ettore Bugatti, clearly paid tribute to his family’s Italian roots, yet he went by Jean due to his French home. For it was in the autumn of the same year of his birth that the Bugatti family moved to Molsheim. In the small Alsatian town, Ettore Bugatti opened his own firm in a disused dye works, before officially signing the tenancy agreement for his factory on 1st of January 1910. Since he was a child, Jean was highly interested in his father's business, spending most of his free time around the workers in the factory. When he was a teenager, he already showed to be very skilled in different crafts and took on more and more tasks and responsibilities. By the late 1920s, Jean Bugatti was already an essential part of the company. He even succeeded his father as the head of Bugatti at 27 in 1936 after XY (strike of the worker’s union tbc). Jean is best known, however, for designing many of the brand’s most renowned models, complementing his father's engineering skill and making Bugatti one of the greatest names in automobile manufacturing. The revolutionary and legendary Type 57 SC Atlantic was Jean Bugatti’s most iconic creation. It featured flowing coupe lines and a unique riveted spine with significantly lower ground clearance. It is considered to be one of the world’s most exclusive and astonishing sport coupés. With only four models built and only two survived with original parts, it is one of the most expensive vintage models. The second Atlantic out of the four was the 1936 Bugatti Type 57SC - Aéro Coupé, a car that would be known as “La voiture noire”; it is maybe the most mythical car in history. After having been built its elegant, iconic appearance was used for internal brochures as well as different motor show exhibitions on the French home turf. It is said to never have had a registered owner, but it was used as the personal car of its creator Jean Bugatti who only allowed his race driver friends like Mr. William Grover-Williams and wife drive. The last secured mention of the vehicle was on an inventory list of a train that Ettore Bugatti used to send some of his most valued possessions to Bordeaux, trying to escape from Nazi-occupied France. What happened to “La voiture noire” after this is a matter of legends. The most common theory is that the Nazis got hold of the vehicle and towards the end of WWII and having dismantled it, they used its aluminum components for their last desperate war efforts. Jean Bugatti himself didn’t live to see the dramatic loss of his beloved “La voiture noire”. On August 11 1939, at the age of only 30 he was driving on one of his usual test drive routes not far from the factory near the village of Duppigheim. A cyclist got through a hole in a tree fence and, thus, surprisingly crossed the road. Jean tried to avoid hitting the cyclist and lost control over his vehicle, crashing into a tree. Today, a monument at the site of the accident reminds us of this tragic loss. Jean’s final resting place is at the Bugatti family plot at the municipal cemetery in Dorlisheim. Very close, at the Château Street Jean and on the Bugatti premises his and his father’s legacy lives on to this day.